My name is Shannon Downey but most folks know me as Badass Cross Stitch. I am an artist, craftivist, community builder, and general instigator. I blend my politics, activism, and art into projects that are designed to inspire others to take action, think, discuss, engage with democracy and their community, and find some digital/analog balance to boot! This is my most ambitious project to date. A massive global craftivism project meant to capture and share the stories of as many women, female-identified, and gender non-binary humans as possible - told by the person who knows your story best – YOU. I’m asking you to create a 12 inch x 12 inch square of fabric (with an additional 1” margin around the piece) that tells the world your story. You can embroider it, sew it, quilt it, felt it, weave it, knit it, play with mixed media; whatever you want so long as it’s on fabric of some sort. As we amass huge quantities, I will build a team and we will create large-scale 3-D structures, stitch your stories together, and use them to skin these structures, creating a massive installation! That’s the analog artifact. There will also be an online gallery and every piece will be displayed along with as much info as you want to share about yourself and your story. That will be the digital artifact. (Hit me up if you are into the idea of joining the building team). This site will grow as the project grows. I am counting on you to tell me what you want and need and help shape the project as we progress. Right now the important part is that you get excited about this and start recruiting!!! Speaking of recruiting…while the artistic outcomes of the project are incredibly valuable, the MOST valuable part of this project will be the connections you all make with each other and the actions you take as a result. I want this project to be about community coming together to not only work on your pieces in traditional stitching bee style but also to plot, plan, and mobilize on the issues that you believe need changing in your community. This is as much about growing a squad and mobilizing as it is about creating art together. I’m here for you if you need additional support, resources, or if have any questions. I’m in this with you and for you. So what do you say??? Are you in? I believe in us! Every Project Deserves A Good Origin Story. I was gifted these incredible antique embroidery pieces. I haven’t stopped staring at them or thinking about them. I'm certain of a few things. 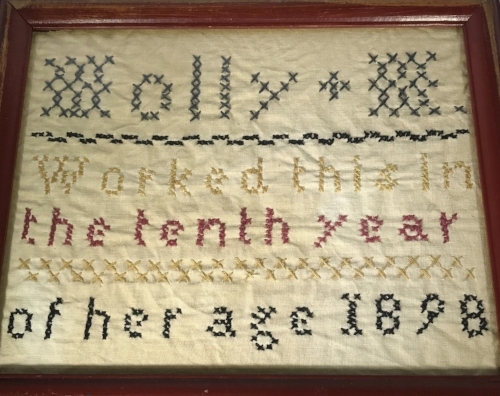 I now live with a ghost named Molly and Molly M. never in a million years expected a cross stitch that she made when she was 10 to last for 120 years and be sold in an antique shop. Aside, from those certainties, I find myself thinking about Molly M. and Anna E. Jones - the people - nonstop right now. What were their lives like? What happened to them? Were they happy? Where were they when they stitched those pieces? Did Anna live in that house (does she live in mine now?!)? Did she sheer those sheep and make her own thread? Were they friends? Relatives? Schoolmates? Did they even know each other? And all of this thinking about Molly M. and Anna E. Jones got me thinking about the importance of legacy and how those legacies are shared and immortalized. What gets included in our history? What gets erased? How do we want our lives to be remembered? What artifacts do we leave behind and what do they tell future humans about us, our lives, our priorities? Do we leave behind truth? Who controls narrative? You and I know that our history books are full of half-truths, outright lies, omissions, and erasures. A history told through a white man’s lens. You and I also know that every life and every story matters. That the more voices we hear only serve to enrich our understanding, our perspectives, and our choices. And so began the 8 month journey to craft (pun intended) and launch this project. 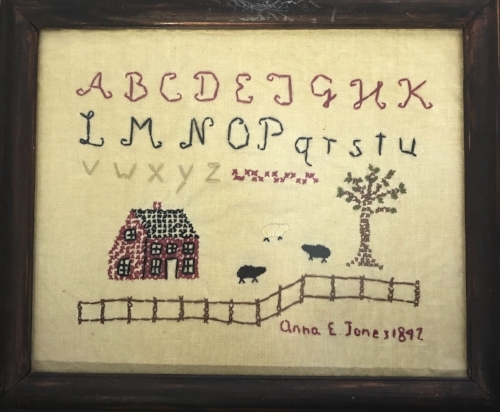 A new global craftivism project inspired by the legacies of Molly M. and Anna E. Jones. Anyone who has ever been in a meeting with me or in one of my classes knows that I always start with WHY. I firmly believe that before you do anything you need to set your intention for it and determine WHY you are doing it. So...here's a short version of the WHY of this project. Expanding the portfolio of global art. Engaging the global citizenship in the experience and participation of creating art. Educating global citizens of all ages in the skillsets of embroidery and fiber art. Strengthening the global community through participation in this craftivism project. Each element of this project is meant to influence micro behaviors on a global scale to catalyze changes in attitudes, perceptions, visibility, skill sets, community norms, civic engagement, and public will. The scope of this project is meant to be so massive that it cannot be dismissed, ignored, or erased. There are all sorts of fun costs associated with a giant global craftivism project. I'm covering the least fun ones but there are things I would like to do that I can't cover on my own. I'm going to applying for funding from different sources but if you feel so inclined and have a few extra dollars that you might want to use to support the project that would be very welcome! ALL of the money will go directly back into the project. Click the donate button below...receive the good vibes!